Any personal experience anchoring there? Pointers to resources or logs? I presume one would sail North of VG and down the East coast to get there. Comments? South Sound. Lovely place. Tons of conch. You can get at it either way depending on seas, we do both. Really too far out of the way to be an anchorage, and i hate to give clear directions on it to keep the stampede out! But, here is enough to keep you out of trouble. If coming from the West, follow along the reef on the outside you will be in about 30 feet of water. The edge of the reef is very clearly defined as it is very steep to. Stay fairly close to the main reef and follow edge of the reef to the north into the bay. Keeping an eye out on your starboard side for an isolated patch of reef that only has about 6 or 7 feet over it. The gap between the point of the main reef and the isolated patch of reef is about 300 feet. As you come around the point of the reef coming into the bay then aim straight for the large tin shed that is on the northeast end of the bay. There is often many fish traps in the area. The deepest water in the bay is a couple of hundred feet from the beach and that is about 8 feet. If you go past the pink house you really have to start picking it if you are going in deeper to the southwest mangrove area. Between the beach and the reef for most of the bay there is 6-7 feet getting shallower as you go closer to the reef. Over near the mangrove hole, there are many shallow areas. Deepest water is very close to the beach. Fishermen clean their conch shells in there by the mangroves and tons of pelicans. Eeks! I just gave way directions to one of my sure fire noone else will ever go to spots!! I would copy the directions down quick before I have a change of heart and take them down!!!. If coming from the West, follow along the reef on the outside you will be in about 30 feet of water. The edge of the reef is very clearly defined as it is very steep to. Stay fairly close to the main reef and follow edge of the reef to the north into the bay. Keeping an eye out on your starboard side for an isolated patch of reef that only has about 6 or 7 feet over it. The gap between the point of the main reef and the isolated patch of reef is about 300 feet. As you come around the point of the reef coming into the bay then aim straight for the large tin shed that is on the northeast end of the bay. There is often many fish traps in the area. The deepest water in the bay is a couple of hundred feet from the beach and that is about 8 feet. If you go past the pink house you really have to start picking it if you are going in deeper to the southwest mangrove area. I own the South Sound Villa on South Sound. Do not use GPS and the moving maps to enter or navigate in South Sound. The map has a 300 ft error. Would surely put you on the reef. South Sound is a fishery protected area. No fishing or conch and legally no anchoring, although boats do anchor in SS. legally no anchoring, although boats do anchor in SS. Thanks for your thoughts -- can you point me to the law against anchoring? 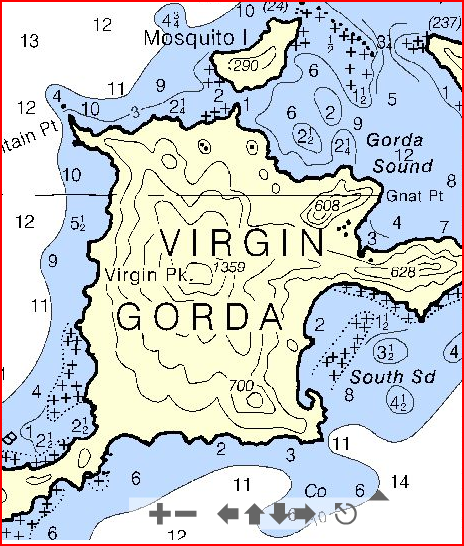 It is news to me that there are specific anchoring restrictions that apply to entire bays/coves/whatever in BVI. Very interesting. Again, news to me. The "no anchoring" designation is pretty clear. Also interesting that Kerry's description included local fisherman cleaning conch on the beach when SS is a protected area. It sure would help to have higher resolution charts, and to understand the overlap of priority and protected areas. The designations would seem to be in conflict. I'll write to DEF this week and ask for additional insight. I'll also compare the areas to the red-lines on Moorings and (if I can find it) Sunsail maps. Did you ever get a response from DEP? More definition on a map? Thank you for reminding me. I never heard back. I'll write again. No luck with better resolution maps. Even Google Earth imagery looks like it is all satellite stuff taken at a slant, so the locations and even some shapes are suspect.